These two teeth (central and lateral incisors) were injured when this patient was in junior high school. An errant baseball fractured and discolored these teeth and caused the gum line to recede. Composite bonding and root canals were completed, but the patient was always embarrassed about her smile. AlloDerm® soft-tissue grafting achieved symmetry and evenness, for a more youthful smile. 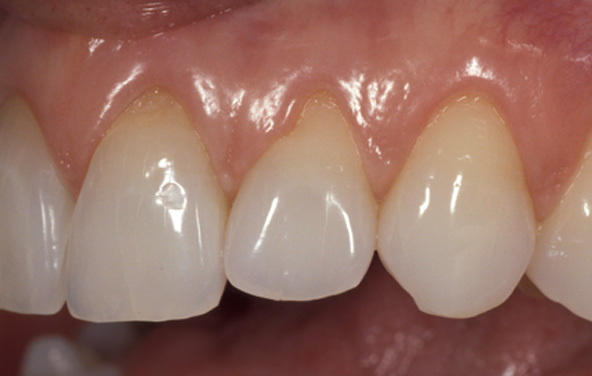 To complete the picture, porcelain crowns restored the two dark teeth, and composite bonding was used to improve the contours of the other central incisor. Our patient was thrilled with the virtually undetectable result. 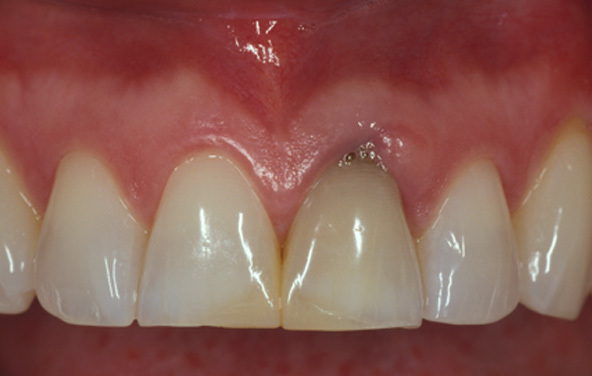 This patient's left central incisor (right side of image) had a receded gum line. A tooth or restoration will never be attractive if the adjacent soft tissue is unhealthy or uneven. The recession exposed a dark root, the result of a previous root canal. The other central incisor had a composite filling that had yellowed. 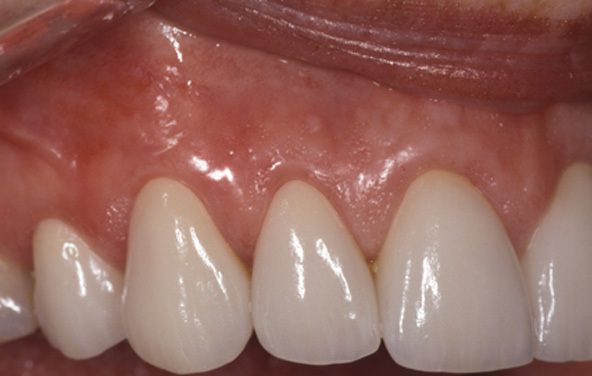 A connective tissue gingival graft restored the health and natural contour of the gum tissue. The teeth were then whitened before a porcelain crown restored the darkened tooth. 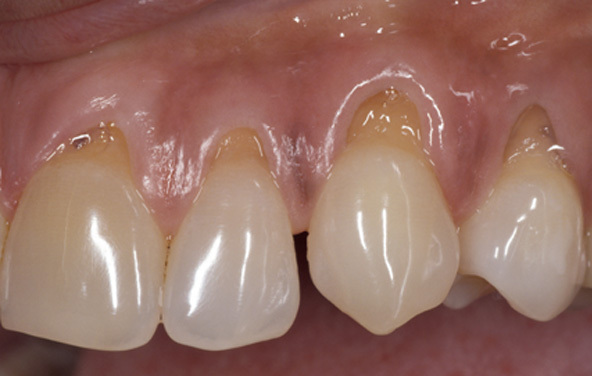 A new composite on the adjacent central incisor completed this remarkable transformation. Except for her receding gum line on one tooth, this patient had a beautiful new smile following her orthodontic treatment. Recession of the gum line is a complication that sometimes can occur with orthodontic treatment. Fortunately, it can be easily fixed. Connective tissue grafting restored the health and beauty of this smile. Using a microsurgical procedure, connective tissue was harvested from her palate and grafted over the weakened tooth. Our patient was amazed at how comfortable and easy the procedure was. Gum recession exposed this patient's roots. In addition to the cosmetic concerns, the exposed roots were more prone to stain, cavities and wear. 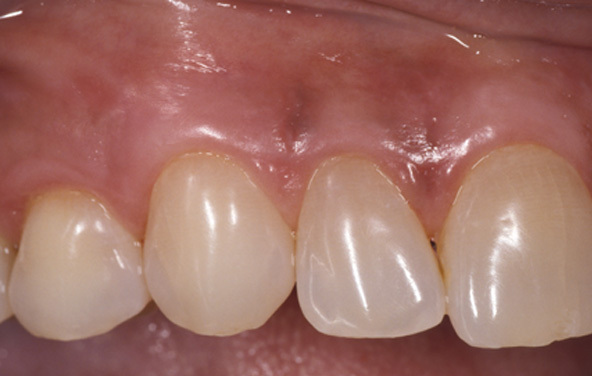 AlloDerm® gingival grafting restored the gum tissue to its original level and thickness. This not only provided the patient with a more attractive appearance, but it also offered better protection for her teeth. AlloDerm® was the grafting material used for this case. 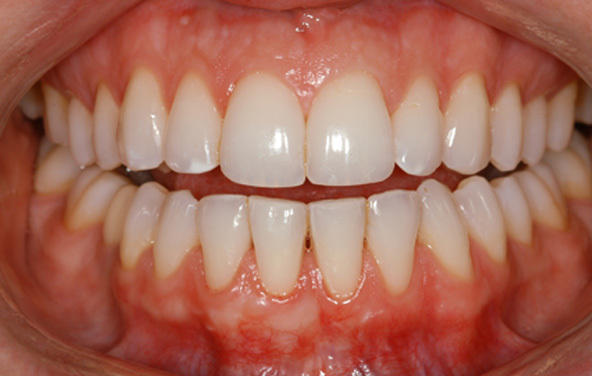 This patient needed gum surgery in order to improve her periodontal health. Gum surgery was also necessary to improve the contours of her final restorations, because her front teeth appeared too short. 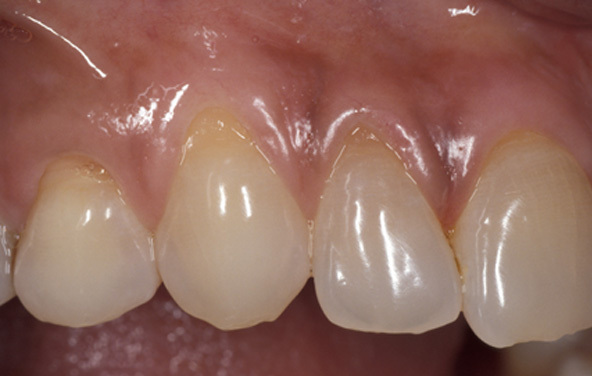 Periodontal crown lengthening surgery was completed prior to restorative treatment. This improved her periodontal health, made her gum line more even and exposed more of each of her teeth, for more attractive restorations. The dazzling result would not have been possible without periodontal surgery. 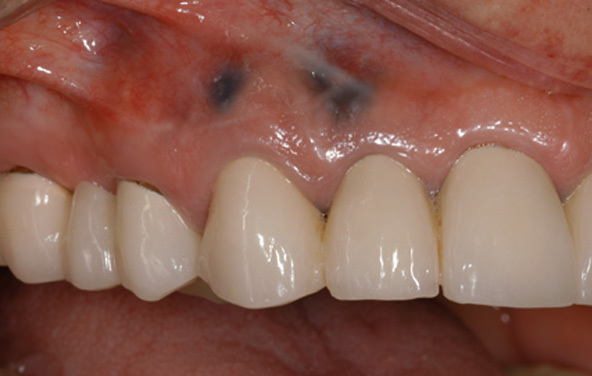 The dark blue spots on this patient's gum tissues are called amalgam tattoos. Our patient wanted to remove the discolorations, which occur when amalgam (silver alloy and mercury) becomes incorporated into the tissues during root canals or while placing amalgam fillings. Luckily, those procedures are not commonly used today. The tattoos were surgically excised, and an AlloDerm® soft-tissue graft was used to fill the void. All traces of the amalgam were surgically removed to prevent reappearance of any discoloration. 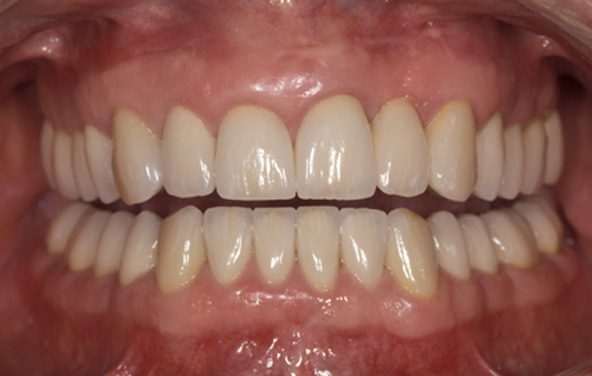 Following healing, porcelain crowns completed this transformation. What would you guess the age of this patient to be? 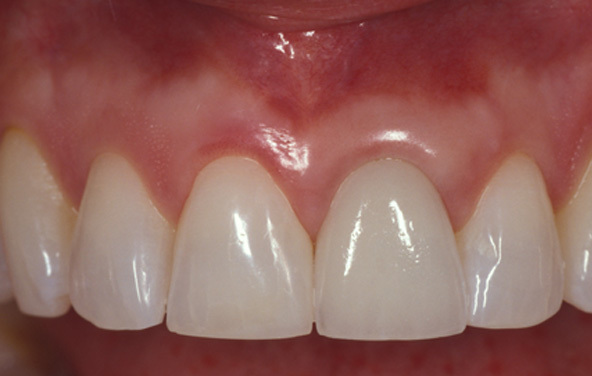 This patient had a gummy smile. The level of the gums can be a misleading indicator of a person's age. Based on the level of this patient's gum tissue, many would guess her age to be around 12 to 14 years. 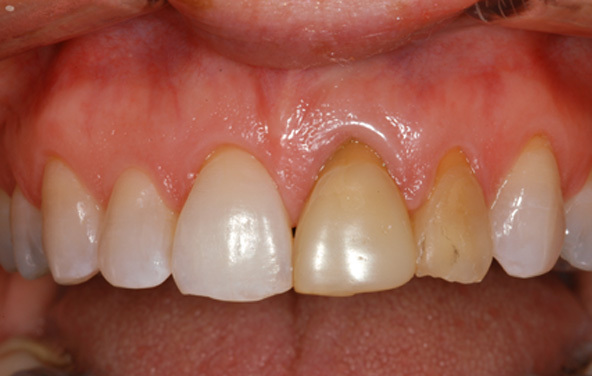 Periodontal surgery made this smile more beautiful by exposing more of each tooth. A gummy smile is not necessarily unattractive. More important is the height-to-width ratio of each tooth. 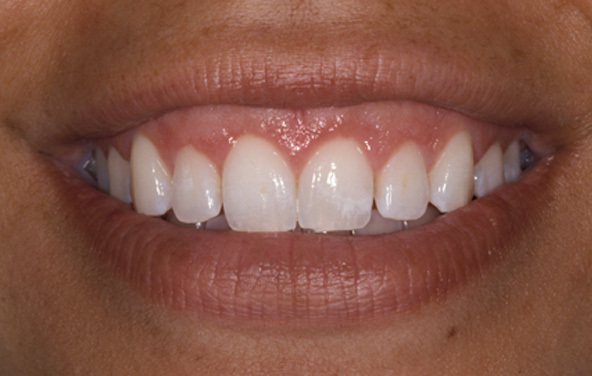 After surgery, her correctly proportioned teeth were whitened to further enhance their vibrancy. The age of this patient at the time of treatment was 26 years. The teeth are too short. These short teeth required restorations. In this case, the biting edges of the teeth were correctly positioned, but the gum line needed to be repositioned. 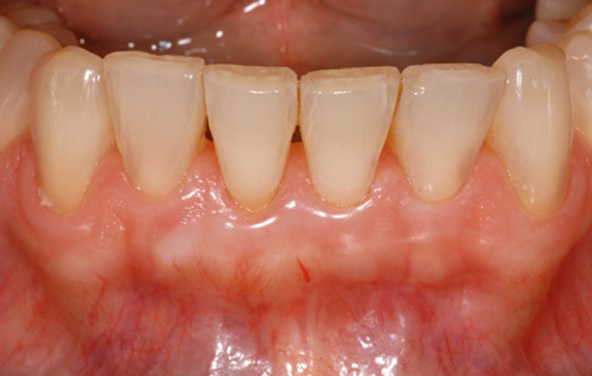 Periodontal "crown lengthening" surgery exposed more of each tooth to allow for prettier restorations. Preliminary planning was necessary to ensure that the surgery would allow final restorations with proper proportions. 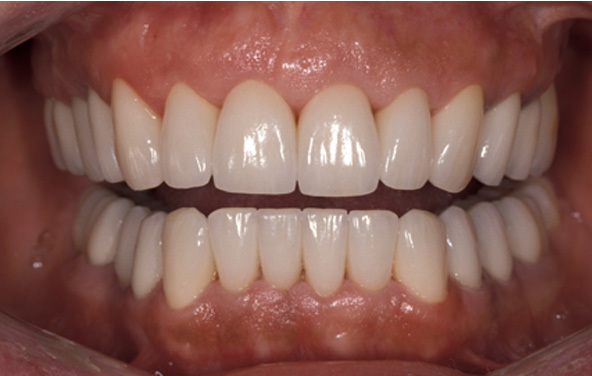 Porcelain crowns completed the beautiful transformation of this smile. 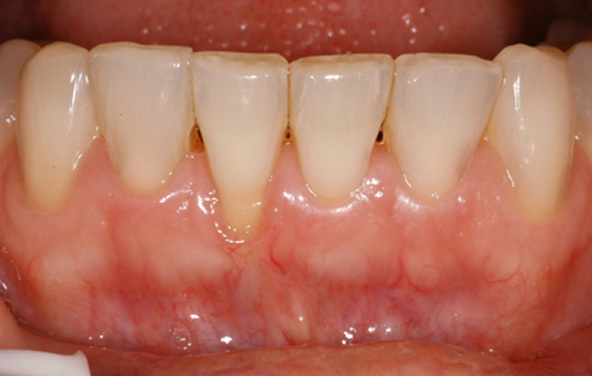 The severe gingival recession on this patient's tooth was a serious risk. 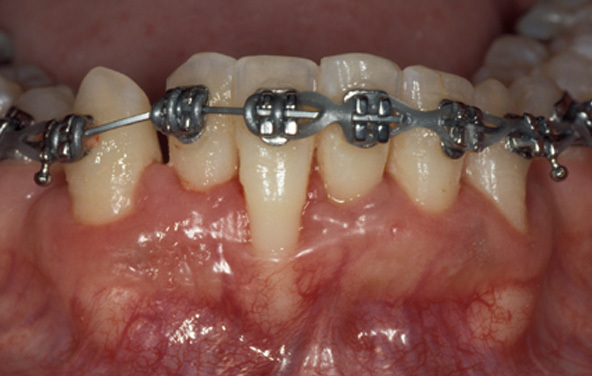 He was in danger of further deterioration, especially during his orthodontic treatment. 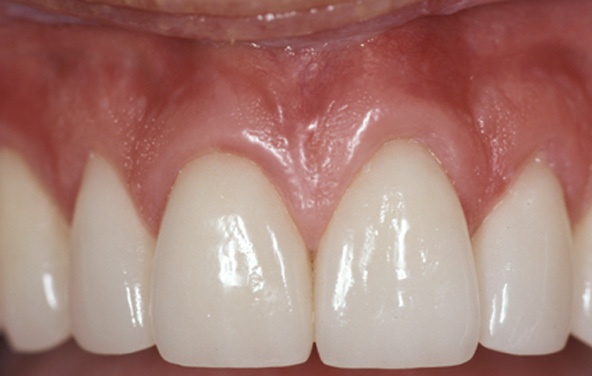 A connective tissue graft allowed for a more attractive smile and a better protected tooth. Gingival grafting, using this patient's own connective tissue, restored his gums to a state of excellent periodontal health. 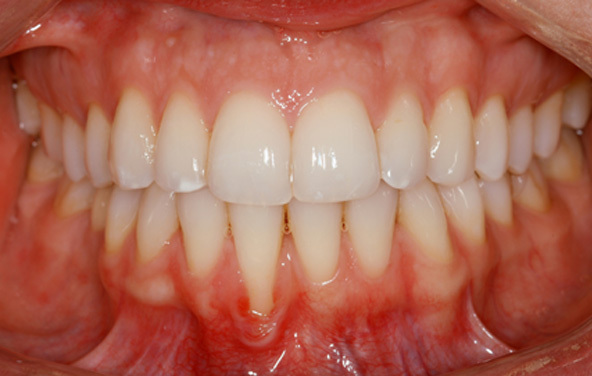 This patient's periodontal health and appearance were both important issues. 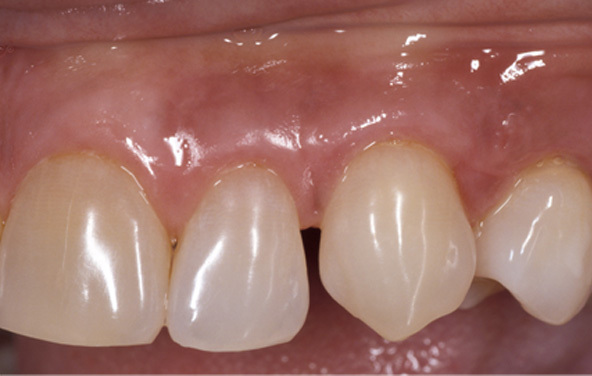 Thin, receding gum tissue necessitated gingival grafting in order to restore the gingival height and prevent further recession. 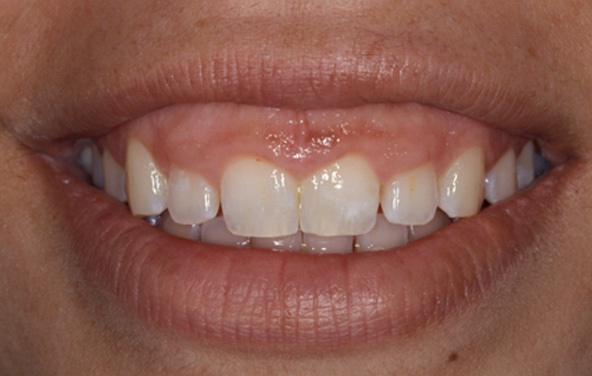 Her gum tissue was restored to normal height and thickness using microsurgical techniques. Because this procedure is minimally invasive, an outstanding result and rapid healing are typical. This patient was delighted with the ease and comfort she experienced both during and after the procedure. The gum tissue had begun to recede from this lower incisor. Our patient complained about sensitivity, and she was concerned that the recession and sensitivity could get worse. 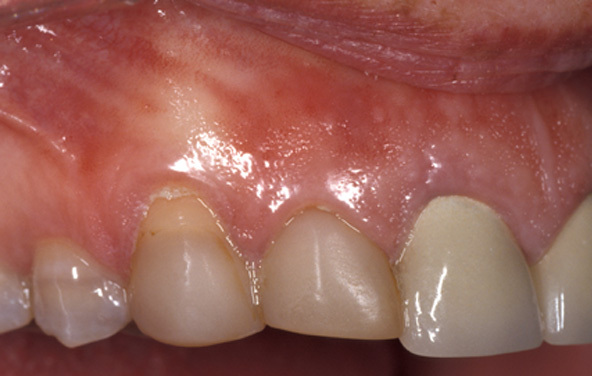 Connective tissue grafting returned the gum line to its normal level. The procedure has improved dramatically, compared to how gum grafting used to be done. Connective tissue grafting is a microsurgery with a very comfortable postoperative experience. Notice that the tissue color match is perfect — a typical outcome of this procedure. 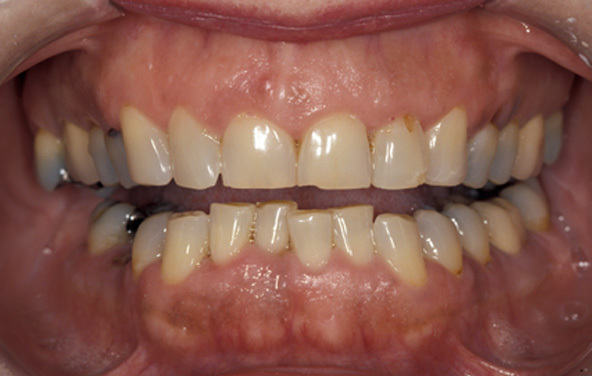 This patient's teeth had yellowed, and his gum line had receded unevenly. 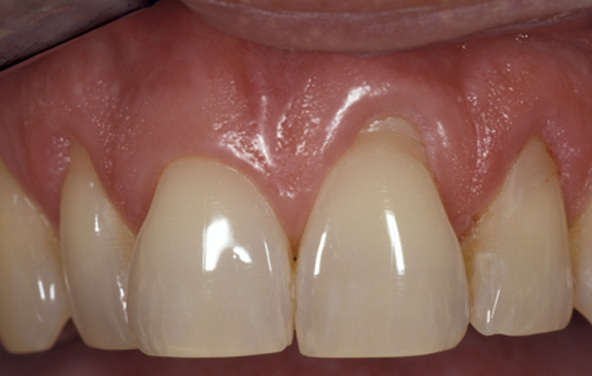 Small corrections to the gums, such as this, can sometimes be made at the same time as restorative treatment. The gum line was moved at the time the teeth were prepared for porcelain veneers. The result was a brighter, straighter smile with a more attractive gum line. The entire treatment was completed in only two appointments. Sometimes, gum surgery must be completed prior to restorative dentistry. 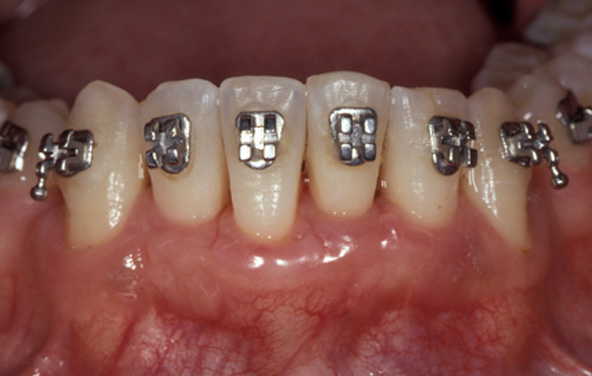 This patient needed a crown on every tooth, but many of his teeth were too short. 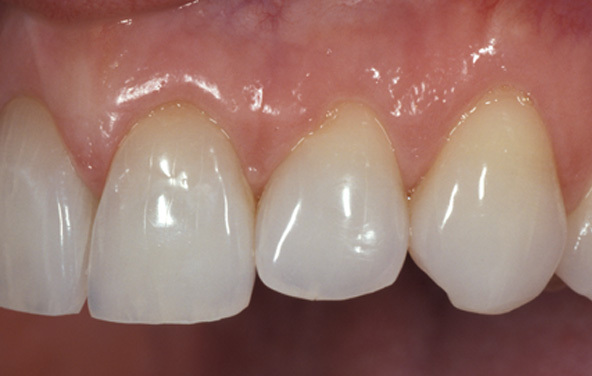 Gum surgery (called crown lengthening) was necessary in order to make the gum line even and to lengthen the short teeth. Crown lengthening surgery allowed for better restorations. Once the gum line was straight and his teeth were lengthened, crowns could be securely attached. 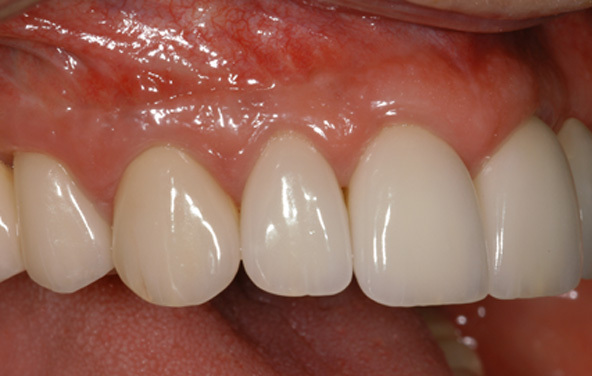 The final result was made much more attractive and durable by using a combination of periodontal and prosthodontic techniques. 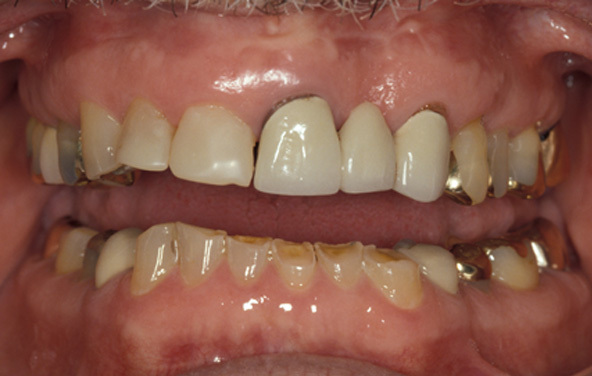 Aesthetically conscious patients can be distressed by even small gingival recessions. 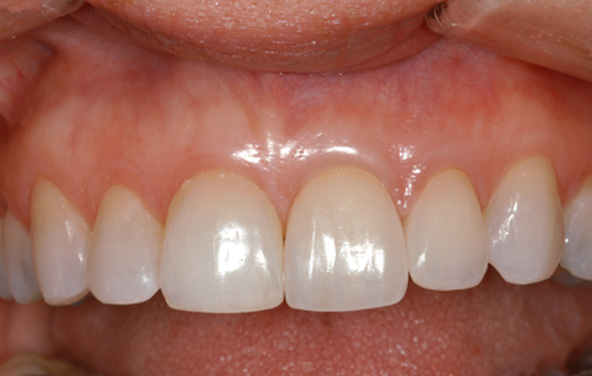 This patient was upset by the recession that occurred above her central and lateral incisors. The gum tissue was repositioned to a normal height. This minimally invasive procedure (called "coronal repositioning" or a "coronally repositioned flap") has a very rapid healing time and an absolutely perfect color match.